We are releasing our updated build phpFox 4.1.6 Build 4 and detail guide to help you clearly understand GDPR as well as actions to oblige. We encourage our clients to get this latest update, you can get it easily within your client area. Are you aware that this is not enought to be compliant with GDPR ? Do you plane to add fields to be absolute compliant ? Can you have any advices about this? Member must be able to export and consult all these data, blogs, events, groups, videos, photos, friends list, private message etc. I think your wrong on that Moskito. The most accepted and most used are csv, xml, or json file...sorry. 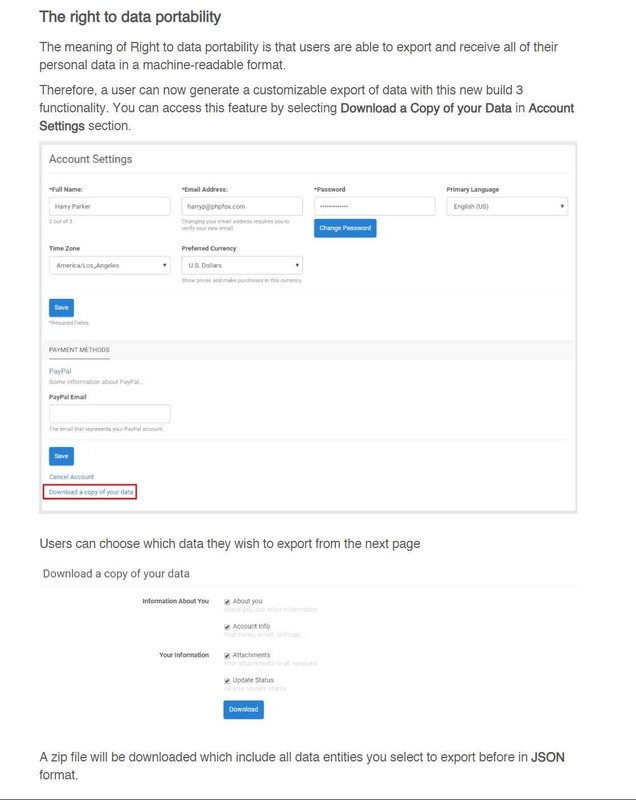 Although,now " Facebook now lets you select certain categories of data, date ranges, JSON or HTML format and image quality to download " and Amazon let you download it as a csv file...so it is really up to the company and their ability to produce the data. Last update on November 6, 2:36 pm by JohnJr. Can we 5 months later hope to have an answer? You may not have understood question because of translation or is it clear enough and you do not want to answer? I think your wrong on that Moskito. The most accepted and most used are csv, xml, or json file...sorry. Although,now " Facebook now lets you select certain categories of data, date ranges, JSON or HTML format and image quality to download " and Amazon let you download it as a csv file...so it is really up to the company and their ability to produce the data. By my profession I master this subject perfectly, thank you, if facebook allows htlm export and not Amazon there is a good reason for that. You have to pay attention to this kind of comment. In this case, there is a nuance, a subtlety in law, which makes that no, phpfox is absolut not GDPR compliant and it should stop to do false advertising. Last update on March 27, 12:59 pm by Moskito. Can this be added soon? Thanks. Scheinwelt, do you not think your $ 19 ad is a little out of place in this topic? We talk about something obligatory, free inclued, so that phpfox can clam "phpfox is gdpr compliant." Anyway it misses more than a line for cookie, the problem is located elsewhere ..
yes, im agree with @moskito. @moskito i understand your point but i just wanted to help. most of my apps are inspired by missing features of the main script and since we have that law about cookies in europe this app is important and needs to be in store... as long as they do not add it to the core. i agree with you that it needs more to be fully compliant and i think they will add more features in future updates. nevertheless european users cant wait they just need the warning now. the price tag may seem a bit high at the first look but you have to think about all the free updates up to this date and the huge amount of customer emails you have to answer all day long (even if their issues have nothing to do with third party apps but they dont know). Last update on March 31, 4:38 pm by Scheinwelt-Media. is easy add a small js code. look at the number of installs... for many users it is not easy to add code. thats the point of using those apps. When i read all this about gdpr , i am just wondering why it is that complicated to implement such a simple thing and move to something else. Lot of energy spent could be used fixing other major issues to really make this community MOVE. I use a web service of expert in GDPR on website. they analyze all code and make for me a details cookie/privacy/tos pages in all my website's. Because even if you add cookies it will still not be enough to make phpfox GDPR compliant. I think they are perfectly aware otherwise it is incompetence. Why do not fix this ? this branch is dead, all the resources have been allocated to the new version of fox which must come out at the end of this year as annouced .. this in less than 8 months from now. Apart from fixed security you will see nothing new in this branch. To be GDPR compliant the work to do is to big, because this point: The right to data portability is absolutely not respected, it's even a big joke what was posted in the first post of this topic. Either they know and they play with time before the next release, or they do not know and it's even worse..
Last update on April 10, 11:35 pm by Moskito. Your site offert blog plugin of younet (or someone else), resume plugin, feedback, petition, forum etc. How Phpfox, which is at heart of this system, can you guarantee The right to data portability? How do your members migrate their writings, photos, resume etc?